Iaijutsu, the art of drawing and cutting with the blade, was seen as an art in its own right and was practised in parallel with Kenjutsu. Iaijutsu (precursor to today’s Iaido) was developed for encounters in daily life where the sword would be drawn and used against one or more adversaries, the aim being to dispatch the opponent with the first (or at most second) strike. 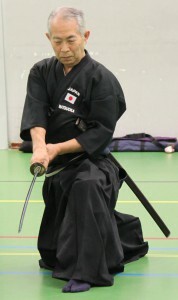 Iaijutsu focuses on techniques performed by having to draw a sword from its saya (scabbard) quickly and decisively. Training in Iaijutsu gave warriors the ability to act quickly, or, some would say instinctively to a situation without hesitation, drawing their swords, cutting and re-sheathing in one smooth motion. Warriors were required to learn specific techniques and practice them repeatedly and as such kata (set sequences of movements) were formed, some of which are still practiced today. 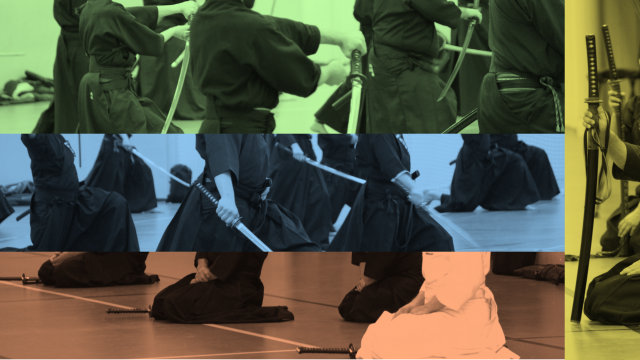 There were many schools of Iaijutsu throughout Japan and thus a wide variety of techniques, methods of striking, parrying and even re-sheathing the blade (some schools even made students take a blood oath to never pass on what they had learned so as to keep the techniques secret and therefore more effective in a fight). Today’s Iaido is seen by some as a spiritual pursuit, where stillness of mind and body are juxtaposed with explosive techniques and movements, teaching the practitioner balance, focus and grace in movement. The fighting spirit of Iaido cannot be ignored and students train with an understanding that they are being taught a highly effective art developed for dangerous encounters. At Kashiwa we study All Japan Kendo Federation (ZNKR) iaido and our koryu (old style) is Shinkage Ryu. ZNKR Iaido: A set of 12 standardised kata created and refined by the ZNKR. These kata are used in gradings and most competitions (taikai) and are taught to a standard throughout the world. Shinkage Ryu: Originating from mid 16th century Japan, Shinkage Ryu (新陰流, meaning ‘New Shadow School’) is a traditional system of iaido. We are a member dojo of the European Shinkage Ryu Family, which aims to promote the study and practice of Shinkage ryu as taught by Matsuoka sensei (kyoshi 8th Dan, Nagoya, Japan).